The Series DH3 Digihelic® Differential Pressure Controller is a 3 in 1 instrument possessing a digital display gage, control relay switches, and a transmitter with current output all packed in the popular Photohelic® gage style housing. Combining these 3 features allows the reduction of several instruments with one product, saving inventory, installation time and money. 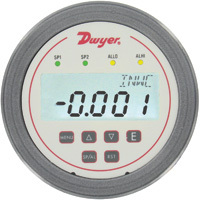 The Digihelic® controller is the ideal instrument for pressure, velocity and flow applications, achieving a 1% full scale accuracy on ranges down to the extremely low 0.25" w.c. to 2.5" w.c. full scale. Ranges of 5" w.c. and greater maintain 0.5% F.S. accuracy. Bi-directional ranges are also available. Housing Material: Die cast aluminum case and bezel. Accuracy: < 5" w.c. (except ±2.5" w.c.): ±1%; All other ranges: ±0.5% at 77°F (25°C) including hysteresis and repeatability (after 1 hour warm-up). Stability: < ±1% per year. Pressure Limits: Ranges ≤ 2.5" w.c.: 25 psi; ±2.5", 5" w.c.: 5 psi; 10" w.c.: 5 psi; 25" w.c.: 5 psi; 50" w.c.: 5 psi; 100" w.c.: 9 psi. Temperature Limits: 32 to 140°F (0 to 60°C). Power Requirements: 12-28 VDC, 12-28 VAC 50-400 Hz. Power Consumption: 3 VA max. Output Signal: 4-20 mA DC into 900 ohms max. Display: Backlit 4 digit LCD 0.4" height LED indicators for set point and alarm status. Electrical Connections: 15 pin male high density D-Sub connection. 18" (46 cm) cable with 10 conductors included. Process Connections: 1/8" female NPT. Side or back connections. Size: 5" (127 mm) O.D. x 3-1/8" (79.38 mm). Weight: 1.75 lb (794 g). Switch Type: 2 SPDT relays. Electrical Rating: 1 amp @ 30 VAC/VDC. Set Point Adjustment: Adjustable via keypad on face. A-298 - Flat aluminum bracket for flush mounting Capsuhelic® gage, 603A, 605, and 3000MR. A-370 - Mounting bracket, flush mount Capsuhelic® gage or Series 600 Transmitter in bracket. Bracket is then surface mounted. Steel with gray hammertone epoxy finish. A-210 - Aluminum tubing, 1/4" OD, 5 ft length. A-211 - Aluminum tubing, 1/4" OD, 50 ft length. A-220 - Flexible vinyl tubing, clear 3/16" ID x 5/16" OD, lengths to 500 ft, per ft.
A-221 - Flexible vinyl tubing, clear 1/8" ID x 3/16" OD, lengths to 500 ft, per ft.
A-222 - Flexible vinyl tubing, clear .240" ID x .375" OD, lengths to 500 ft, per ft.